The United States District Court for the Western District of Texas (in case citations, W.D. Tex.) 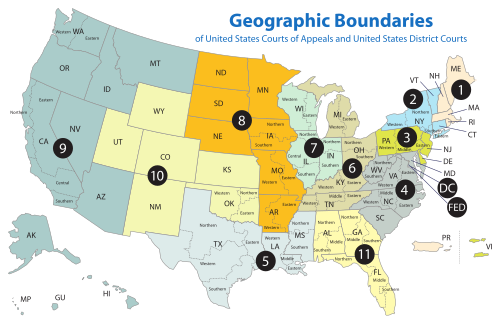 is a federal district court. The court convenes in San Antonio with divisions in Austin, Del Rio, El Paso, Midland, Pecos, and Waco. It has jurisdiction in over 50 Trans-Pecos, Permian Basin, and Hill Country counties of the U.S. state of Texas. This district covers over 92,000 square miles (240,000 km2) and seven divisions. The first federal judge in Texas was John C. Watrous, who was appointed on May 26, 1846, and had previously served as Attorney General of the Republic of Texas. He was assigned to hold court in Galveston, at the time, the largest city in the state. As seat of the Texas Judicial District, the Galveston court had jurisdiction over the whole state. On February 21, 1857, the state was divided into two districts, Eastern and Western, with Judge Watrous continuing in the Eastern district. Judge Watrous and Judge Thomas H. DuVal, of the Western District of Texas, left the state on the secession of Texas from the Union, the only two federal judges not to resign their posts in states that seceded. When Texas was restored to the Union, Watrous and DuVal resumed their duties and served until 1870. Appeals from cases brought in the Western District of Texas are taken to the United States Court of Appeals for the Fifth Circuit (except for patent claims and claims against the U.S. government under the Tucker Act, which are appealed to the Federal Circuit). Judge Orlando Luis Garcia is the Chief Judge of the Western District of Texas District Court. The United States Attorney's Office for the Western District of Texas represents the United States in civil and criminal litigation in the court. The office is currently occupied by John Bash. 12 Homer Thornberry TX 1909–1995 1963–1965 — — L. Johnson appointment to 5th Cir. 23 Edward C. Prado TX 1947–present 1984–2003 — — Reagan appointment to 5th Cir. 25 Emilio M. Garza TX 1947–present 1988–1991 — — Reagan appointment to 5th Cir. ^ Recess appointment; formally nominated on December 14, 1880, confirmed by the United States Senate on December 20, 1880, and received commission on December 20, 1880. ^ Thornberry was nominated for a seat on the W.D. Tex. by President Kennedy, but he was confirmed after Kennedy's assassination and was appointed to the Court by (i.e., received his commission from) President Johnson. This page was last edited on 11 April 2019, at 04:40 (UTC).